Navratri is an important Hindu festival and is celebrated with much fervour. Talimpu aka sundal varieties are offered as neivedhyam to Mother Goddess during the nine days. 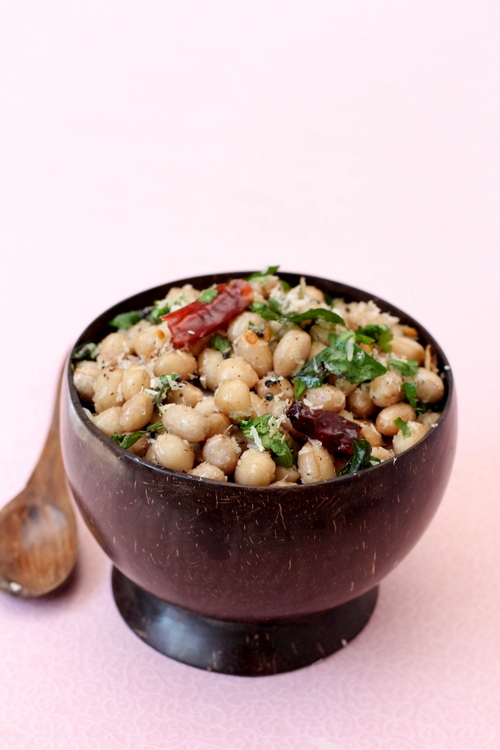 A popular sundal variety among Navratri recipes is Peanut Sundal aka Vergusenaga pappu Talimpu. Not only popular as neivedhyam (offering to Goddess), Peanut Sundal is one of those quick and easy snacks for tea time. The humble sundals make for protein rich, nutrition packed, guilt free and yummy snacks with tea. 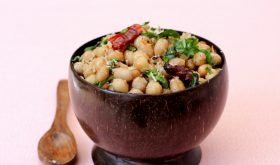 Usually legumes like peanuts, kidney beans, black eyed beans, moong dal, chana dal, black chickpeas and white chickpeas (kabuli channa) are soaked in water, steamed till soft and tempered with spices with minimal oil. Peanut Sundal is the tastiest among all the sundal varieties and makes for a easy, healthy and tasty tea time snack. Soak peanuts in water for at least 20 mts to 30 mts. Pressure cook the peanuts with 1/2 tsp salt and 1 1/2 cups water upto 3 whistles and drain the liquid. If cooking over stove top, boil in salted water till soft. Drain and keep aside. Heat a pan, add oil and once hot, add mustard seeds. Allow them to splutter. Add urad dal and as they turn red, add asafoetida, curry leaves and red chili. Immediately add the green-chili ginger paste and saute for a few seconds. Add the boiled peanuts and toss the contents on medium flame. Turn off flame and add grated coconut and mix well. Remove to a serving bowl. Add lemon juice and garnish with fresh coriander leaves. Another variation is to add a tsp of kura podi. Kura podi is prepared by dry roasting a tbsp of coriander seeds, a tsp of channa dal and a red chili, cooled and ground to a fine powder. By Sailu Published: October 13, 2013 Peanut Sundal is one of those quick and easy snacks that's protein rich, nutrition packed & yummy.A gem among Navratri recipes and fasting food at its best. Are the peanuts used in this recipe with / without skin? Simple and perfect! Could you please tell me where you picked up the bowl in the pic? I picked it up in Kochi (Kerala). Its made with coconut shell. Thank you for the info. Has been following your blog since a year. Your eggless pancakes were the first one’s to try. They came out just perfect! Nice clicks and crockery!